Should the Colts have played their starters for those last two games to go for glory? Should have they risked Peyton Manning's health for a perfect season? Those last two games would not be talked about much if the New York Jets didn't benefit from Indy's laying down in Week 16 (and week 17 against Bills). The Jets beat the Colts and was able to edge out the Ravens for the #5 playoff spot. This left the Texans at home dialing up tee times for the weekend. Now there is no guarantee that a starter-led Colts team would have beaten the playoff hungry Jets, but lets at least say that a second-string-led Colts team is not a 100% effort from Indy for week 16. So what if the Colts didn't lay down and did beat the Jets? Certainly the Texans would be a lot happier. But, of course, if the Texans had beaten the Colts just once this season, they would not have to cry about this outcome. A team that runs-the-table (16-0) receives two byes, meaning, a berth directly to the conference championship game. Simple, huh? So how does this work for the other five playoff teams? Hmmmm. Two potential scenarios to incorporate an Indy two-bye plan. Remove a team from the playoffs, giving only 5 teams playoff berths. In this scenario, only the #1 Colts receive a bye (double-bye if you will). And now the #2 Chargers would actually play in the wildcard round. So the #6 Texans would still end up home on the couch with this setup. Add a team to the playoffs, giving 7 teams playoff berths. In this scenario, the #1 Colts and #2 Chargers get their wildcard byes along with the #3 Patriots. But the #2 Chargers and #3 Patriots play in the divisional round while the Colts still kick back and wait another week. The #2 Chargers would now play the newly added seventh team, in this case, those defending champion #7 Steelers. And those grumpy #6 Texans get in as well. Obviously, the NFL would prefer more teams in the playoffs. So scenario #2 is a winner, right?! Uh-oh, wait just a second ... there's an extra week needed for this scenario to be played out. Lucky the NFL has that extra week between the conference championships and the super bowl. That week will be needed here, but then another issue pops up. The NFC super bowl team would have an extra week of rest over the AFC team. Hmmmm. Maybe this flaw is what the NFL has to give up so a team like the 14-0 Colts stay motivated for a perfect season. 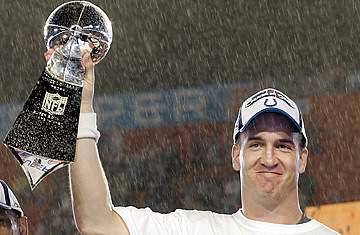 And maybe, the Colts would have run the whole table and Peyton could hoist up that shiny-football trophy. Contact. ©2019 by rich hartland. blog software / best hosts.